* Marques Colston had his best game of the season and appeared fully recovered from his shoulder injury. He caught 7 passes on 11 targets for 118 yards, including a 38-yard TD that gave the Saints an early, albeit short, lead. Long a favorite Brees' target, Colston reestablished his presence in the Saints' offensive rotation and seems primed to make a big impact going forward as opponents shift their schemes and coverage to Jimmy Graham who, again, had a big day. * Graham also caught 7 passes on 11 targets totaling 124 yards. Graham had a key 43-yard reception that enabled the Saints to get into FG range just before the end of the first half. Graham continues to be the focal point of the Saints' offensive plan, and he has excelled game after game. On the season to date, Graham is second in the league in catches, third in targets, third in yards, and second in first downs. Lastly, with his fourth consecutive 100-yard game, Graham ties Tony Gonzalez for the most consecutive 100-yard games by a TE in NFL history. * Patrick Robinson continues to improve and play like the first-round pick he was drafted as. Robinson played another excellent game with two tackles for losses and one pass defended (nearly a spectacular diving interception). 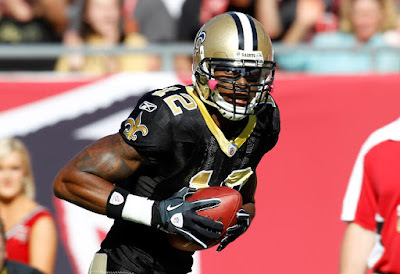 On the season, Robinson leads the Saints with two interceptions; has a blocked XP to his credit; and leads Saints' defensive backs in tackles for losses. Why Robinson was replaced in the starting lineup by Tracy Porter and relegated to the nickel role against Tampa is still a mystery and was, in my opinion, one of the bigger coaching gaffes of the season. Porter again seemed rutted in malaise, playing passively and ineffectively; he was repeatedly beat by Preston Parker (not exactly Calvin Johnson) and appeared lethargic and uninspired. 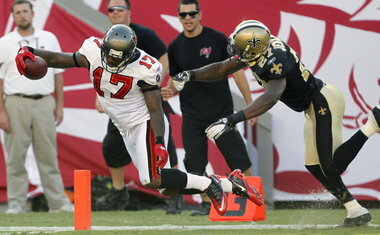 Robinson, last week, was the subject of this NOLA.com piece outlining his ascension in the Saints' defense. Moreover, through six games, Advanced NFL Stats ranks Robinson 18th in +WPA and 21st in +EPA among the 100+ CBs rated this season (Porter is far down this list). Lastly, Patrick Robinson and Jabari Greer--collectively--lead the NFL in passes defended for a CB tandem and have the highest collective +WPA rate--among CB tandems--according to Advanced NFL Stats. Robinson is clearly the Saints' second-best CB and should be seeing as many snaps as possible going forward. * Of the tens of thousands of hours of football I've watched in my life, I'm not sure I've seen anything stranger than the Sean Payton sideline injury in the 1st Quarter. 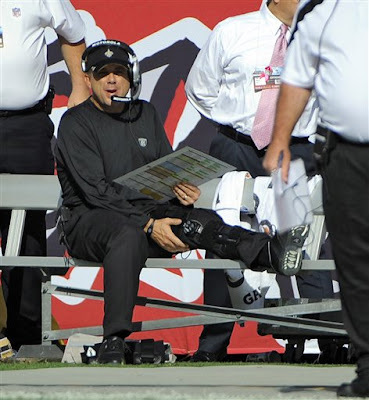 It was a harbinger of things to come on the day, and Payton's all-black outfit (on an exceptionally hot October day) seemed to symbolize a day of things-gone-wrong for the Saints. Playing the first half with Payton immobilized on the sideline bench, and further playing the second half without him coaching at all, the Saints fought an uphill battle for most of the day. Without question, the loss of Coach Payton was significantly impactful in terms of play-calling, adjustments, and (perhaps) team morale. Get better, Coach P.
* The Saints' run defense was pitiful on Sunday. 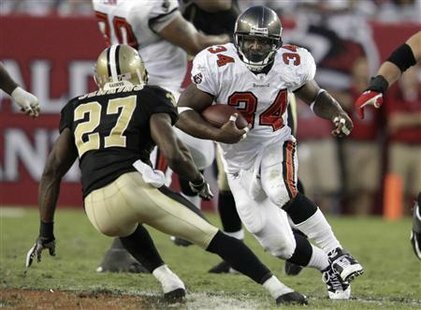 31-year old Earnest Graham, subbing for an injured LeGarrette Blount, gutted the Saints for 109 yards, averaging 6.4 yards per carry. To put this in perspective, Graham had not logged a 100-yard game in over three years, yet Sunday he appeared Earl Campbell-like against the ineffectual Saints' defenders. Particularly, Roman Harper embarrassed himself with an awful, lackadaisical effort, completely whiffing on Graham at the line of scrimmage and allowing Graham to rumble 34 yards downfield. For a player who prides himself on stout run defense and reliable tackling, Harper couldn't have performed any worse on a play that encapsulated the Saints' defensive effort on the afternoon. * The Saints' front-seven, particularly the defensive line, underperformed yet again. The defensive line again generated no pressure on the opposing QB, logging no sacks and just one measly QB hit. A dreadful performance. The complete lack of impact by the defensive line has been a lingering concern this season, and is a hindrance to the Saints' ability to play effective defense. * The rushing attack was equally non-existent on Sunday. The Saints averaged a paltry 3.5 yards per carry, with Pierre Thomas averaging 1.6 yards per attempt and Mark Ingram averaging 2.4 yards per attempt. Further, the Saints' offensive line appeared dominated most of the day at the line of scrimmage. The Bucs came into the game 24th in rush defense, allowing 123 yards per game. On Sunday, they held the Saints to a meager 70 yards. With the pending return of Chris Ivory in week seven, it will be interesting to see if the Saints make any changes to their RB rotation. Granted, the Saints' running game has been mostly effective this season so I wouldn't expect any major changes in the short-term. It is, however, a situation that bears watching. * This is a horse that has been beat to death, but turnovers continue to haunt the Saints. With four turnovers committed and no takeaways on Sunday, the Saints stand at -7 in turnover margin for the season. This ranks an abominable 31st in the NFL, and will certainly doom the Saints' chances to even make the playoffs if the trend continues. The bottom four teams in turnover margin thus far are the 2-4 Eagles, the 4-2 Saints, the 1-5 Panthers, and the 1-4 Cardinals. Notice any similarities? The Saints' winning in the face of a negatively-lopsided turnover margin is simply not sustainable. Even worse (yes, that's possible), the Saints rank dead-last in turnovers generated with four measly takeaways. * Equally ugly is the Saints' continued impotence in the red zone, both offensively and defensively. On Sunday, the Saints went 1-4 in the red zone and allowed the Bucs to score a TD on their lone trip into the Saints' red zone. On the season, the Saints rank 23rd in red zone offense (this measures percentage of TDs scored in the red zone), trailing the likes of Cincinnati, Arizona, Kansas City, and Minnesota. Not exactly offensive powerhouses. The Saints' offensive inability in the red zone is mind-boggling for a team with a wealth of options and an excellent playcaller in Sean Payton. Defensively, the Saints rank a disturbing 30th in red zone defense, allowing opponents to score TDs 67% of the time they enter the Saints' red zone. This is a jarring stat indeed, and one that should be frightening to Saints' fans. This lackluster combination of red zone incompetence and permissiveness is another factor that, if sustained at current benchmarks, will significantly hinder the Saints chances at qualifying for the postseason. Outstanding breakdown! keep it up sir! Big Ray! Thanks for reading. Much appreciated. I'd also rate the pulled pork and blondies in the good category! Watch NFL Football live stream online. Never miss a moment of your favorite NFL team this season with on-demand options from NFL. com Game Pass. Massive play markers and also the condensed game feature enable you to observe the foremost crucial moments of a game in but half-hour. Watch each touchdown, every sack, and each interception from every team live stream. The excitement and thrills of NFL game day action are commonplace along with you. Watch Chicago Bears vs. Green Bay Packers football game live is usually a unique beast of its own.